The Sheldon Jackson Museum’s January Artifact of the Month is a Yup’ik mask (SJ-B-102). The mask was collected from Andreafski by Sheldon Jackson in 1893. Unfortunately, the museum has very little information on file about this mask. There is no record of the maker, nor the ceremonies or dances in which it was worn. Masks were frequently collected throughout history without any documentation of the stories they told. Because the connection between the masks and the stories they tell is so fundamental, we are limited in our ability to fully understand this mask and its purpose, yet we can appreciate the craftsmanship that went into making it and find some common elements that are typically present in masks from this part of Alaska. When examined in isolation, it is extremely difficult to understand the meanings of Yup’ik masks. The masks were designed to be used within a bigger context involving a story, dance, mystical experience or song or all of these elements - without such clues, a reconstruction of the original meaning is challenging, if not impossible. The myriad of personal styles, the lack of standardization of mask forms and symbolism, and the diversity of such a rich artistic tradition also present challenges for analysis. Many museums, with Yup’ik mask collections, including the Sheldon Jackson Museum, have gaps in the recorded stories their masks tell or have no record of the original meanings at all. This is in part because the majority of Yup’ik masks in museums were collected between 1877 and 1900. During this time, collectors, including the Reverend Sheldon Jackson, often failed to record much, if any contextual information about the masks they collected and in some cases, did not have access to such information. The greatest period of collecting of Yup’ik masks notably coincided with a time of immense change in life for the Yupiit people. With the arrival of Moravian missionaries in 1885 and Catholic missionaries in 1888 came the stifling of traditional mask making, dancing, ceremonial life, language, and consequentially, a discontinuity in the passing on of traditional knowledge and stories between generations of Yupiit. Masks made south of Bering Strait are extremely diverse in style and form. In form, they may represent humans, animals, spirits, other beings, physical objects, plants, or celestial bodies. Sometimes the representations are realistic or abstracted to the point that a face is not readily recognizable. Sometimes masks are carved in an extremely fine fashion with great surface details and others, roughly hewn. Masks with faces may seem to lack any expression while others are sad, happy, fierce, or comical. Many masks from the Yukon and Kuskokwim region feature some of the same details, some of which are present in the January Artifact of the Month. A masculine face is usually depicted with an upturned mouth or with labrets at the corners of the mouth – both appear on the Artifact of the Month. A female face is usually shown with a downturned, frowning mouth, sometimes with a central lower lip labret or radiating chin tattoo. Masked or transformed characters can be shown with black goggles around eyes, as shown in the January Artifact. 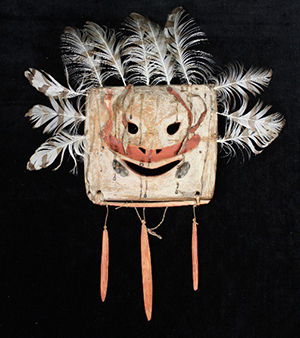 Many Yup’ik masks have pegged wooden teeth. Both the insides or backs of mouth holes, eye holes, nostrils or holes in hand appendages, if present, are sometimes painted red on masks from this region, perhaps to help the wearer better connect with other levels of the universe and permit spirits to pass through. Limbs of spirit creatures are sometimes carved in the abstract and have snouts with whiskers or pointed teeth. Other times, human-like hands, arms, and feet may be present. Crescent shaped eyes and twisted mouths can suggest lunar phases. Indications of a spirit may be shown with red, white or orange spots and inua may be shown with smaller faces within another face. Red lines may also be indicative of lifelines. The use of encircling concentric hoops and feathers in a circle might suggest other realms of the universe. Some masks have blood splotches, perhaps reflecting recent feast. Some Yup’ik have wooden dowels or elongated feather-like pieces hanging down, perhaps adding to the effect when being danced. Some masks have animal effigies attached to them, perhaps meant to evoke the return of animals for the coming season’s harvest. The January Artifact of the Month is square-like in shape and slightly convex in the center. In the center of the mask is a face with almond-shaped eyes that point upward and outward. It has a nose faintly indicated with a flat ridge and triangular nostrils below which is a red mustache and a large mouth with perforated, upturned ends. Labrets, indicating a masculine face, are on each side of the mouth. There is some spattered runny-looking black paint and a faint white background. A small wooden rod is attached along the bottom from which three wooden sticks are hanging. Across the forehead are four strips of fish skin hanging and speckled feathers are set across the top and along the side. The January Artifact of the Month will be on exhibit until January 31st. Visitors may see the mask, many other Yup’ik masks, and other examples of Yup’ik artifacts atthe museum during operating hours - Tuesday through Saturday between 10 am and 4:00pm. General admission is $6, $5 for seniors, and free for those 18 and under or members of either the Friends of the Sheldon Jackson Museum or Friends of the Alaska State Museum. There are historical accounts that provide descriptions of Yup’ik masks and ceremonies and some firsthand accounts of mask use from Yup’ik elders and strides made in collecting and documenting stories about masks from culture bearers, particularly by Ann Fienup-Riordan, in her seminal works, Yup’ik Elders at the Ethnologisches Museum Berlin: Fieldwork Turned on Its Head and The Living Tradition of Yup’ik Masks, but much remains unknown.